If you read one book, this has to be it. Let me start by stating I do not normally read these types of books. I was asked to read it by a friend who I take heed of their opinions of books, and thus, I read it, beginning as merely a form of ‘obligation’, until I found myself sucked into the story. Diverse characters, well written (again, I don’t normally go for what you’d call teen angst), but after reading the book, it gives you an entirely new outlook on supposed teen angst. Sometimes, it isn’t angst, it is a much bigger issue, but one that can, with professional help, be nipped in the bud. If you’re a parent with a child who is becoming a tween/teen, you really need to read this. If you are a teacher, you need to read this book. If you like good writing, you need….ya know what? Read it. Regardless of the reasons, you should take the time to read this. It will open your eyes and help you to understand youth and others as well. Learn that different doesn’t mean bad, and that ‘cry for help’ is there, if you know what you’re looking for. Take a bit of time, relax and enjoy yourself. This is that rare book that you walk away from having learned something, and Felicia Johnson does one thing I truly appreciate. She doesn’t ‘push an agenda’. She tells a story. She tells one hell of a good story. Read this folks. It’s worth the effort. Kristin is your guide into a world most of us never see, and it’s a world we really need to understand. This is a permanent addition to my Kindle collection, and is now one of my top ten books. When I received this book, I wasn’t sure what I was walking into. It’s unlike the books I normally read and I wasn’t sure if I could stay in the head space that was needed to complete it. But Felicia Johnson makes it so compelling that you get lost in the story. I know very little about BPD, and after reading Kristen’s story, I felt like I needed to research a bit more. Kristen is a young woman who is fighting a battle of wills against herself, her doctors, her disorder. I felt completely wounded by her struggle. I found times when I wanted to tell her to just snap out of it, and then realized, that isn’t an option with someone who has a mental disorder. It was so foreign to how I think that I realized I needed to restructure my thought process in order to fully grasp theirs. I give this 5 lipsticks. It’s amazing. And it should be read by anyone who knows someone or is someone going through mental illness. This is the most amazing book I have ever read. As someone who suffers from BPD it was captivating and very accurate. I couldnt put it down. This story follows Danny a young guy who we see developing mental health issues. The struggles of a teen with diabetes, OCD and bi-polar disorder are well written taking me, the reader into his world, feeling his emotions and getting caught up in them. The story shows well, the normal struggles of being a teenage boy making me ask myself where does this boy fit and what will help him? I couldn’t help fall in love with Danny and become emotionally invested in his life and where his journey will take him. 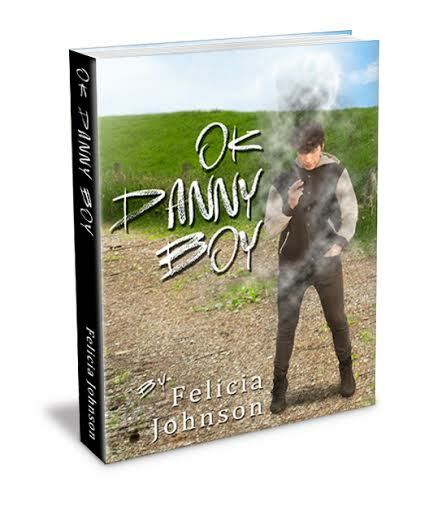 Felicia has done an amazing job of writing Danny’s story allowing the reader to feel moved, happy, sad, frustrated and all manner of emotions. The story shows well the struggles of mental illness and describes clearly the OCD and bi-polar that Danny experiences. It gives people who have mental health difficulties, those who work within mental health and those who have no experience great insight into this world making it a great read for all. It leaves you hanging for more and wanting the back stories to other characters too! I can’t wait for the next instalment! Please do read this book as you won’t be disappointed! feel lost now, can’t wait to read the next one. Ok Danny Boy Chaos Vol 1 is a beautifully written, insightful, sensitive book about mental health’s impact on individuals, families, friends and all loved ones. This book is a raw look at the painful, beautiful reality of going through the unimaginable and the effects mental illness has on you and everyone around you. I was incredibly moved by this story as I can relate to Daniel so much.My best advice would be to stop reading this review and begin reading the Ok Danny Boy series instead. Heartfelt This trilogy just gets better and better! 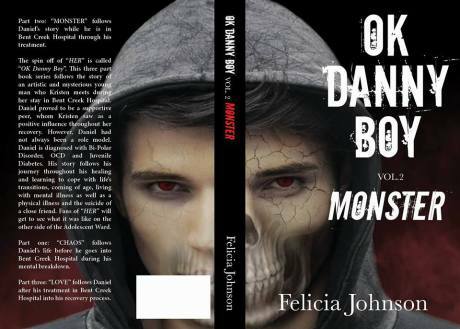 Over the weekend, I finished reading Ok Danny Boy Monster Vol 2 by Felicia Johnson. The story delivered a powerful message for those who face a life long struggle with physical illness, and mental illness. This book was a real eye-opener to mental health. The impact on family and friends and the healing with the correct medication and counseling; that takes many trials and errors. Danny’s story is so full of raw emotion that it pulls at your heartstrings. Some stories need to be told and retold until society begins to understand them. Ok Danny Boy Series is yet another story of lives touched by severe mental illness, and it is told well. It is also a story of how mental illness can be hidden, ignored, or simply disguised for a very long time before it is finally addressed. If you hadn’t had the chance to read these books yet don’t wait any longer go and Grab Ok Danny Boy Chaos Vol 1 and Okay Danny Boy Monster Vol 2 Now. Book three in this trilogy will release later this yr and I can’t wait for the conclusion.